NIGHT AND DAY. 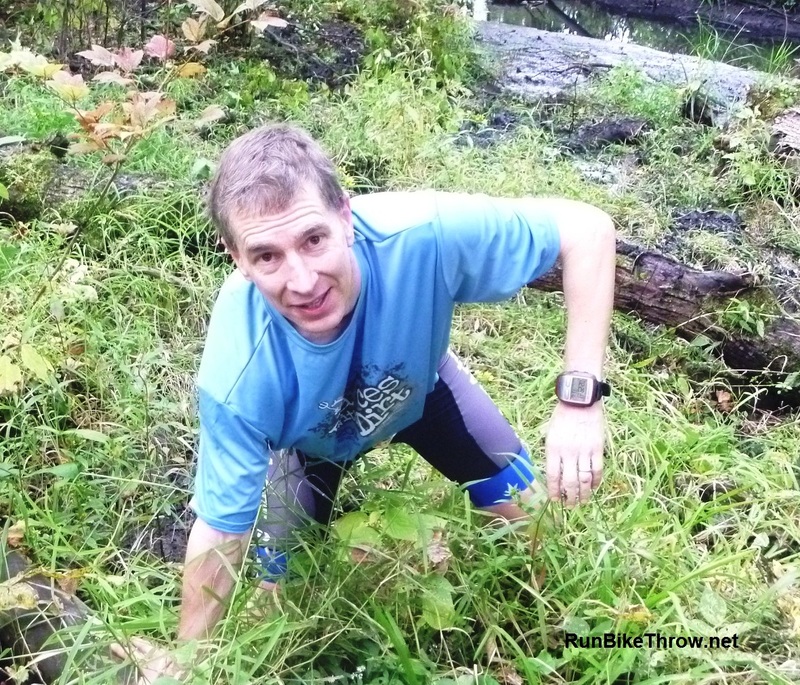 That’s the best way to describe the difference between my experience at Run Woodstock earlier this month and the Dances with Dirt – Hell 50K last Saturday. 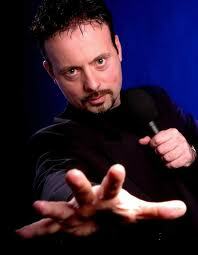 He’s really not a bad guy once you get to know him. Cool and dry where Woodstock was hot and wet, it was a perfect day for a long trail run. With no danger of bonking, I ran strong from start to finish and felt great the whole time. But every one of the four Dances with Dirt races this year had its particular challenges, and the Hell race was no exception. 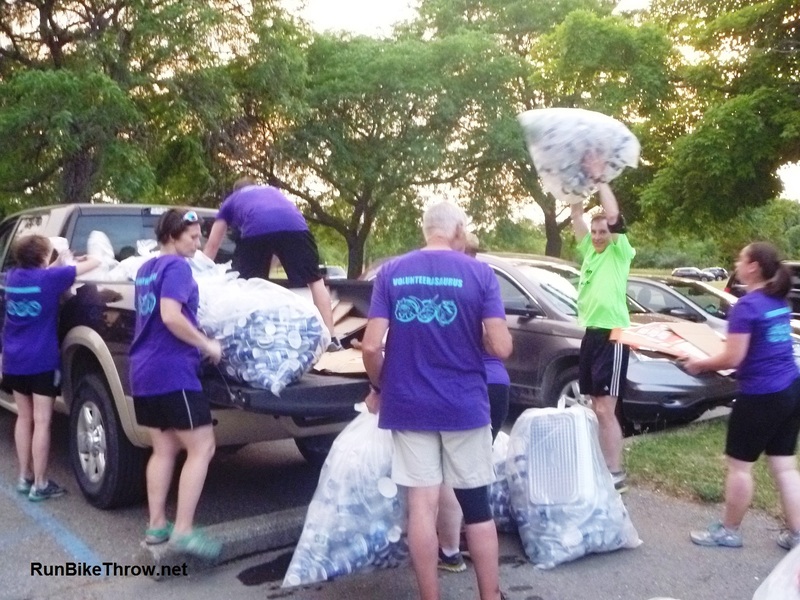 As this was the 20th anniversary of the run, they promised to “pull out all the stops” – and they delivered. Here’s a sample of what the 50K and 50 mile runners went through. I avoided this by walking over some logs. But just as I was congratulating my cleverness – well, see below. There wasn’t much mud, but what was there was spectacular. The reason you can’t see my legs in the photo below is that they’re completely submerged. 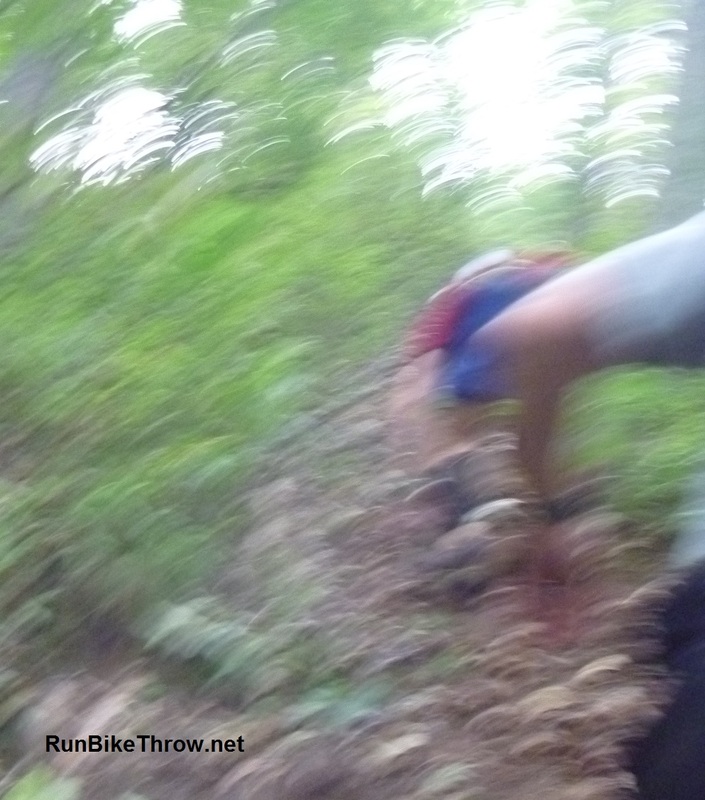 Fortunately, the runner in the photo above helped pull me out. 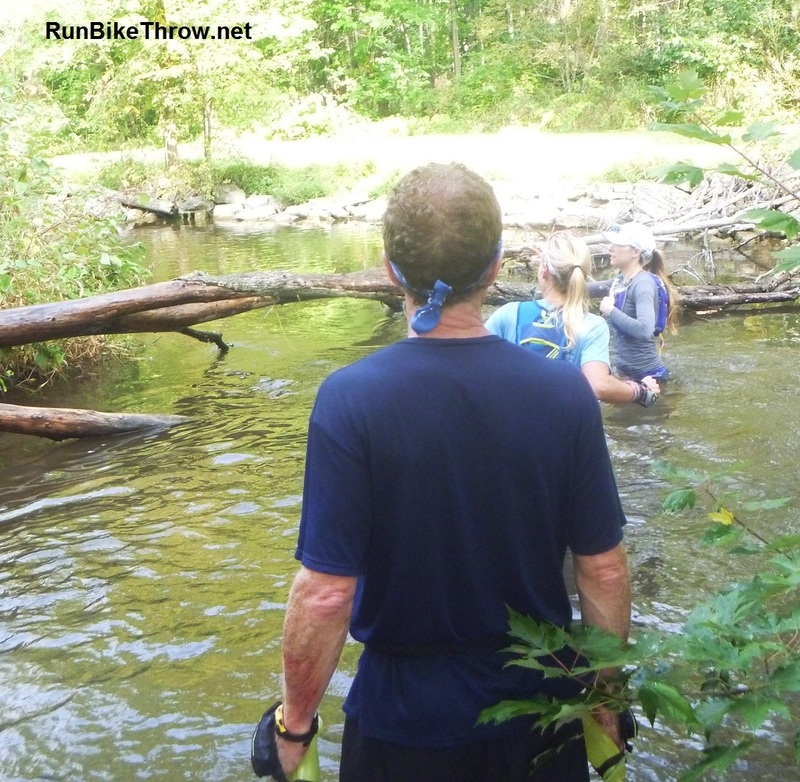 There were only a couple of water crossings – but one was a downriver wade of a quarter mile. As you can see from the runner’s shoe, we are climbing an almost vertical slope. I wish this photo had come out more clearly – but then again, it’s got kind of a neat impressionist look, don’t you think? And there was some bushwhacking into parts unknown. 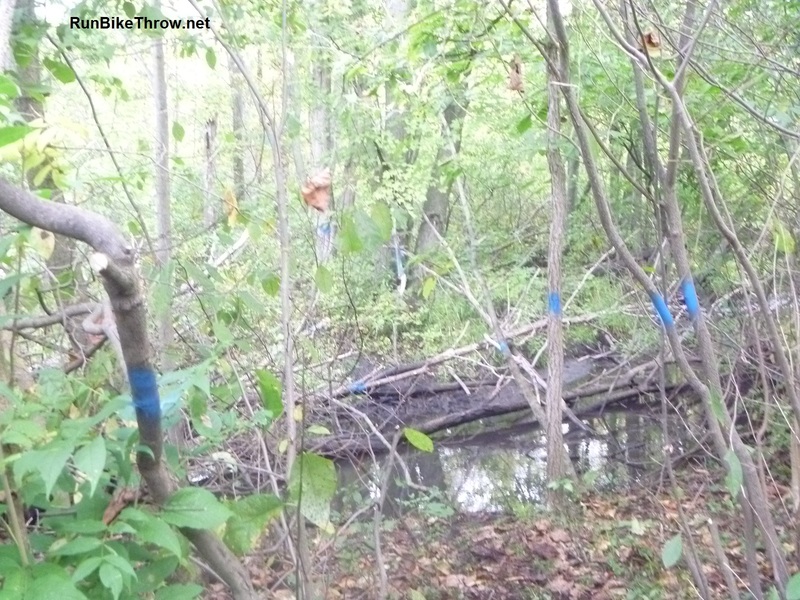 The blue paint is the “trail” marking. But it all paid off with a finish in the top 20 overall. And I got a special belt buckle for completing all four DWD events this year! My strong finish was helped by some gear adjustments based on what I’d learned from my failed 100K attempt. 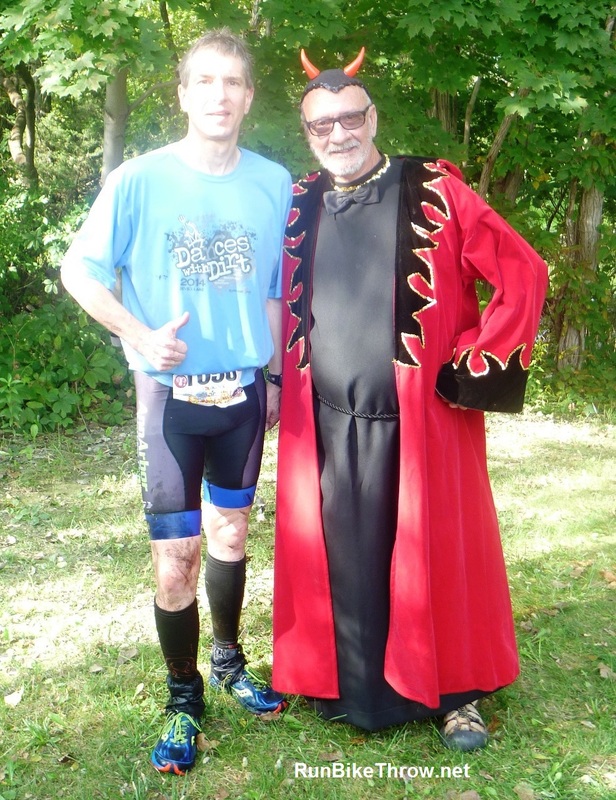 To tackle the chafing problem, I wore my triathlon shorts. I’d never run more than a 5K in them, so I was violating the rule of “don’t try new stuff in a race” – but since triathlon gear is designed for marathons (the Ironman running distance), I figured I was safe. And it worked! No chafing, and they dried out quickly after that long river wade. I wore the same shoes as for Woodstock, but wore thinner socks and applied a bit more tape around the toes. I also rubbed Gold Bond Friction Defense over my feet. The result: no blistering, even though my trip through the mud meant running 10 more miles in soaked shoes. 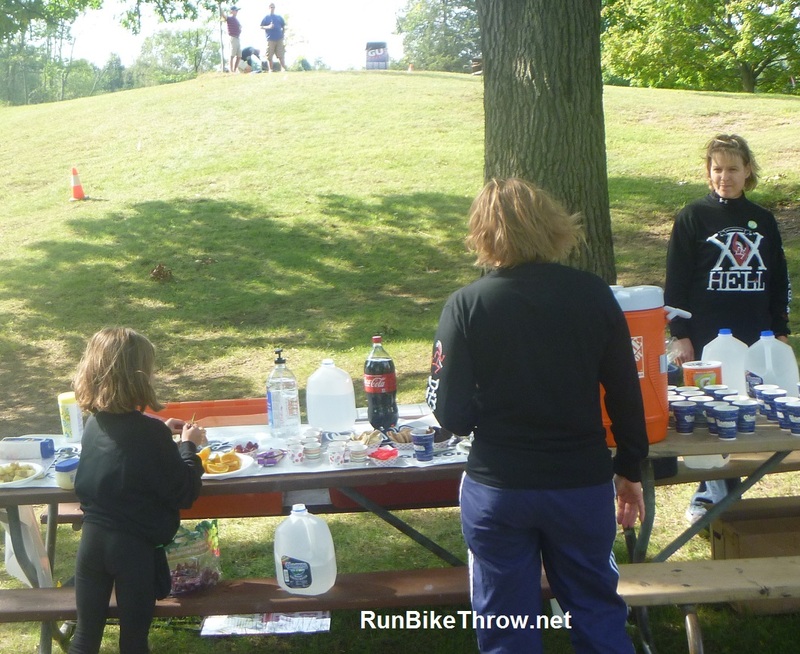 With the usual well-stocked aid stations there was no shortage of food and water. All the same I sucked down a couple more Gu than usual, which I think helped keep my energy level up. Something to consider for future ultras. Wow, Coke really is available everywhere. 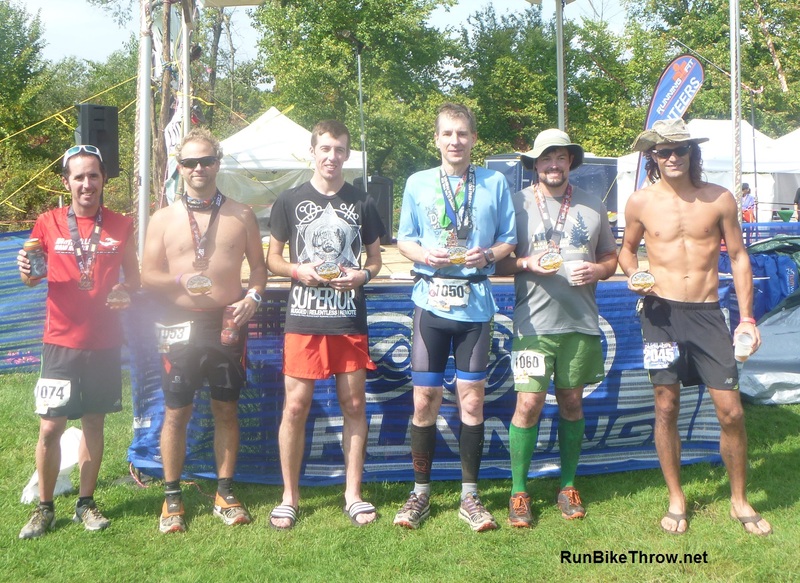 Next up: 25K this Saturday on the Vasa trail in Traverse City. 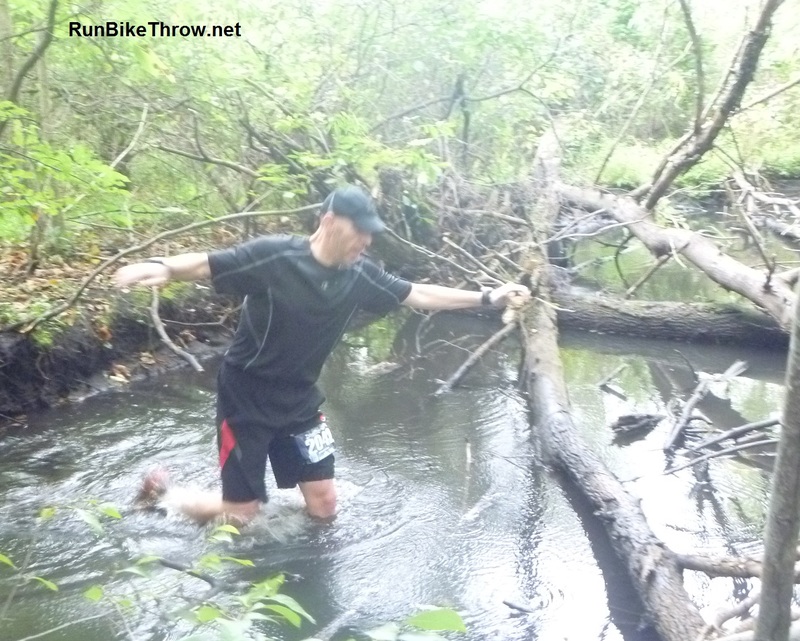 This entry was posted in Running & Cycling and tagged 20th anniversary, 50K, Dances with Dirt, fitness, Hell, medical, mud, Running, series, ultramarathon. Bookmark the permalink.